On average, applicants spent 90-140 hours on the MBA application process. Poets & Quants provided a lengthy summary and analysis of the Association of International Graduate Admissions Consultants (AIGAC)’s recent survey on b-school applicants’ opinions and experiences of the MBA admissions process. Here we’ll provide some highlights from the survey, and then I’ll provide a few additional thoughts. 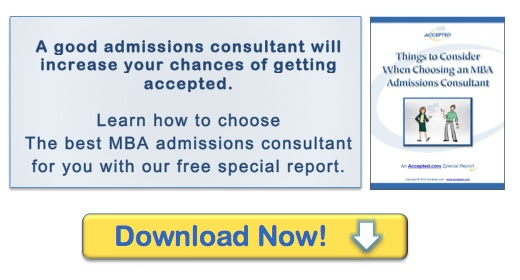 • 57% of respondents reported that they used the assistance of admissions consultants when applying to b-school. • 91% of respondents who used the service named the essay assistance as the most valuable admissions consulting service. The five most popular schools according to the respondents were HBS, Wharton, MIT Sloan, Kellogg, and Stanford. • On average, applicants spent 90-140 hours on the MBA application process, 70-110 hours excluding the GMAT. • 38% of applicants were asked to write or draft their own letters of recommendation. For international applicants, that number was at 50%. • The most important stat above is that applicants reported spending 70-110 hours on the applications excluding GMAT prep. Don’t underestimate the amount of time required by the application process, specifically the essays. Frankly, I believe the estimates above both for GMAT prep and essay writing are on the low side. Indeed, the time required by the application process is one of our motivations for our Early Bird Special. We encourage you to start early and submit a thoughtful, unhurried application. And we are putting our money where our mouth is. • At the conference, the letters of recommendation stats attracted the most attention. Apparently many of the admissions directors in attendance were shocked that so many applicants are asked to draft the letter for the recommender’s signature. I was shocked they were shocked, but they were. (Lots of shock going around.) I hope that the discussion surrounding the letters of recommendation leads to a less burdensome and more authentic recommendation process. If it does, however, it probably won’t happen until the next application cycle. In the meantime, seek recommenders willing to spend the time to write their own strong letters on your behalf. • While I don’t believe that 57% of all applicants use consultants (this survey was conducted by consultants and probably skewed towards those who use our services), I do believe that the percentage of applicants benefiting from consultants is growing. This article was sponsored by PaGaLGuY. PaGalGuy is India’s largest network of MBA aspirants with 700,000 unique visitors per month. 80% of all GMAT takers in India use PaGaLGuY to network with schools and alumni for their application process, research, essays, VISA tips, etc. PaGaLGuY has been continuously solving one of the major challenges faced by a lot of B-schools outside India -to consistently reach-out to Indian GMAT takers/applicants who may be a good fit for their programs. Last updated on July 11, 2013.